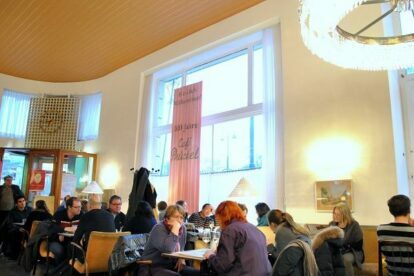 If there is any place in Vienna I’ve loved from the very first moment, I can only think of Café Prueckel, my top favourite “Kaffeehaus” for many years. Part of the reason is that I really go for good (cheese) cake and pastries and the other part is that I like nice vintage interior. Here you’ll find both. The café is more than 100 years old, though it was renovated in the 1950’s. And it hasn’t changed much since then. So once you enter Café Prueckel it is kind of a time warp. Where the only signs of modernity are the laptops used by the students of the nearby Academy of Fine Arts. Here you can lose hours by just sitting around, having one melange after the other while browsing through the huge collection of (also international) newspapers. The incredibly high ceiling, intimate corner booth with 50’s style armchairs, lamps and tables where you can sit and relax for hours – what else do you need after a long stressing work- or tourist day? For those who think that coffee and cigarettes is a “must”: there is still a smokers area. The only big letdown: the very conservative owner! So gays and lesbians, go kissing and revolt or avoid this place!